NEW ORLEANS – The first major weekend of the collegiate track & field season is in the books! Here are 10 athletes who stood out the most and were named National Athletes of the Week by the U.S. Track & Field and Cross Country Coaches Association (USTFCCCA) on Tuesday. Anderson Peters had an incredible series this past weekend at the Texas Relays. Peters had five of his six throws end up in the all-time top-15 of the collegiate record book, including what is now the third farthest mark in collegiate history (86.07m /282-4). Other marks from the meet come in at No. 4 (84.73m/278-0), No. 7 (83.46m/273-10), No. 12 (82.85m/271-10) and No. 15 (82.72m/271-4). This is the second week in a row that Peters has been named National Athlete of the Week. He is only the second NCAA DI athlete in the five-year history of this award to win the honor on back-to-back weeks, joining Sam Mattis in 2016. But what goes up 4.73m (15-6¼) will also set a collegiate record. That’s what Olivia Gruver did this past weekend at the Stanford Invitational. Gruver, who made her debut in a Washington uniform in Palo Alto, California, topped the collegiate record set by Arkansas’ Sandi Morris nearly four years ago. She needed two attempts to get over the bar, but when she did, she did so with room to spare. 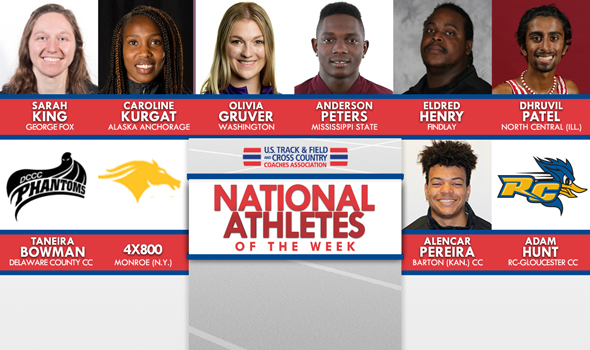 This is the first time that Gruver has been named National Athlete of the Week during the outdoor season. It is also the first time that a Washington Huskies’ athlete has earned the distinction. Eldred Henry is a National Athlete of the Week selection after etching his name once again into the NCAA Division II record book. The junior became the second-best performer in NCAA DII history with a best chuck of 20.36m (66-9¾) in the shot put to place second overall against a field of athletes across all collegiate divisions at the Florida Relays over the weekend. The British Virgin Islands native also took seventh overall in the shot put. Henry is just the second athlete in program history to win the National Athlete of the Week honor during outdoors, joining Justin Welch who captured it during the 2015 season. Caroline Kurgat is a National Athlete of the Week honoree after rewriting the NCAA Division II record book this past weekend. The senior posted an NCAA DII record time of 32:08.09 in the 10,000 to place fifth overall against a stacked field of NCAA DI and professional athletes at the Stanford Invitational. She was the third collegiate finisher in the event, slotting behind Boise State’s Allie Ostrander and Syracuse’s Paige Stoner. Kurgat is the only athlete in program history to get honored with a National Athlete of the Week selection during outdoors. She has now done so three times in her career, having captured two awards during the 2018 season. Dhruvil Patel mixed it up with some of the best runners across all collegiate divisions in the 10,000 this past weekend at the Stanford Invitational and came out with one of the fastest times in NCAA DIII history. Patel, running in the elite section of the event, crossed the finish line in 28:50.87, which stands as the No. 3 all-time effort. He is just one of three runners at the NCAA DIII level to go under 28:52.00, joining record holder Ian LaMere (28:38.63) and Dan Mayer (28:48.4h). This is the second time that Patel has been named National Athlete of the Week during the outdoor season in his career. He was also honored on May 1 of last year. Sarah King started the outdoor season in grand fashion. Right now, King is ranked No. 1 individually in the 200 and 400 at 24.73 and 55.01, respectively. She has also helped out on a pair of top-ranked relay teams, including the No. 1 4×400 relay that was run this past weekend at the California Collegiate Open. King served as the third leg as the Bruins got the baton around in 3:46.98, nearly five seconds faster than runner-up Williams. King also competed in the 100 and 200 this past weekend, winning both. Her time in the 200 (24.76) would be ranked No. 1 nationally if she didn’t already run .03 seconds better two weeks earlier. This is the second time that King has been honored as National Athlete of the Week during the outdoor season. King also earned the distinction last year on March 27. Alencar Pereira is a USTFCCCA National Athlete of the Week for the second time this season after winning the hammer at the FHSU Classic this past weekend. The freshman not only won, he posted the third-best performance of all-time in NJCAA DI history with a best toss of 65.69m (215-6). He didn’t just stop there as he also added the No. 6 and No. 7 best marks of all-time as well. Pereira was also named National Athlete of the Week on March 19. We couldn’t just decide on one as the entire Monroe (N.Y.) 4×800 relay team stepped up this weekend to win the National Athlete of the Week honors. The group of Faten Larbi, Lethabo Seema, Claudrice McKoy and Dillon McClinock posted a time of 9:00.61, which was the second-best time ever ran at the NJCAA DI level. The performance placed the Mustangs second overall in the event at the Raleigh Relays against a field of NCAA DI athletes. It is the third time in school history that Monroe has captured a National Athlete of the Week award. It is also the first time that a relay team has captured honors at any of the JUCO levels. Adam Hunt is the National Athlete of the Week after hitting big marks in the discus and hammer this past weekend at the Danny Curran Invitational. The sophomore posted the top marks so far this outdoor season in both the discus (49.82m/163-5) and the hammer (53.30m/174-10) at the NJCAA DIII level as he went up against a field that included NCAA DII athletes. The showing won him both events and he also took seventh in the shot put at the meet. Hunt is the ninth athlete in total and fifth male overall in program history to get selected for the weekly national award. Taneira Bowman is a National Athlete of the Week after taking over the national leaderboard across three different events this past weekend at the Danny Curran Invitational. The freshman posted the top time in NJCAA DIII in the 100 (13.15) and is now third overall in both the 200 (26.86) and long jump (4.91m/16-1½). She also leads the nation in the triple jump which she posted back on Feb. 2 at the Frank Colden Invitational. Bowman is the first athlete in school history to win the National Athlete of the Week award.